Currently Gallenberg PC, a Los Angeles County consumer class action lawyer is investigating the consumer class actions and companies listed below. * If you are interested in pursuing a class action to vindicate your rights or want to learn more about your consumer rights, we encourage you to call us to discuss a potential class action, please call us at (818) 237-5267 (Burbank) or (213) 986-8432 (Los Angeles) or (310) 295-1654 (Beverly Hills) or you can fill out our quick and easy online Case Evaluation Form; this is the fastest way to get your case screened by an attorney. We do not charge prospective clients for a confidential telephone intake or online case review. Hidden Fees Class Action: Have You Been Charged Hidden Fees? If a large corporation has charged you fees you did not authorize or were not disclosed to you, or charged higher fees than you were told, even if these fees are small, this may be illegal, and you may be entitled to a monetary recovery. Contact us immediately to learn more about this investigation and any legal rights that you may have. *Products that say they have nutritional values they do not have. Example, a product claims to cause weight loss but it does not. *Products that don’t provide the benefits they claim to provide. Example, a food product says it is 100% natural, but it is not. *A service provider says the service will guarantee a certain result but it does not. *Beers claiming they are “craft” beers, “craft” brewed, or brewed by a “craft” brewery when they are brewed and/or owned by large macro breweries, not by independent craft brewers or craft breweries. Possible example, Day of the Dead Craft Beer, owned and brewed by Cerveceria Mexicana. For more information about this investigation please call Mr. Gallenberg Esq. at (818) 237-5267 Ext. 103. Defective Products: Has Someone Sold You A Product That is Defective? Consumers are routinely defrauded or misled while corporations become more profitable, if you know of a corporation that is violating the rights of consumers, please contact us immediately. 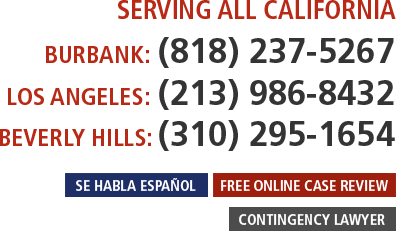 Contact A Los Angeles Consumer Class Action Attorney Today! If you have any information about any of these investigations or are interested in pursuing a claim yourself, submit your case for review to a Los Angeles consumer class action lawyer; at (213) 986-8432. For Beverly Hills, please call (310) 295-1654. To contact a lawyer in Burbank and surrounding San Fernando Valley, please call (818) 237-5267 or you can fill out our quick and easy online Case Evaluation Form; this is the fastest way to get your case screened by an attorney. We do not charge prospective clients for a confidential telephone intake or online case review.